Ballard expanded its foothold in China in 2016 when its power systems were tapped for the largest-ever deployment of hydrogen buses. A decades-long struggle by Canadian fuel cell manufacturer Ballard Power Systems Inc. to make money off hydrogen may finally be paying off as the world’s largest automotive market begins converting vehicles from petroleum to a system that emits nothing but water. The Burnaby, B.C., company, which has mostly posted losses since it was publicly listed in 1993, expanded its foothold in China in 2016 when its power systems were tapped for the largest-ever deployment of hydrogen buses. In February 2017, Ballard signed a deal with Zhuhai Yinlong Energy Group to supply 10 fuel-cell engines to the China-based battery-electric bus maker. That agreement calls for Ballard to deliver the FCveloCity-MD 30-kilowatt engines in 2017 to power Yinlong buses destined for smog-choked Beijing. Since July, Ballard shares are up more than 80 percent on the promise of more sales as the world seeks alternatives to mainstay energy sources like oil and coal. China is Ballard’s biggest market for fuel cells that convert hydrogen to electricity, and it’s a major influence on the global renewable energy industry. Ballard CEO Randy MacEwen said Yinlong alone is projected to produce 35,000 EV buses this year. When the Asian country began adopting solar power about a decade ago, the cost of panels fell and installations around the world surged 20 fold. Auto sales are surging in China, compounding air pollution in its cities. Ballard’s headstart in China is giving it a leg up over other publicly traded fuel cell companies, including of New York-based Plug Power Inc., Connecticut-based FuelCell Energy Inc. and Mississauga, Ontario-based Hydrogenics Corp., which target different fuel cell markets, are all down in the past year. Nearly 40 per cent of Ballard’s sales came from China last year and that’s expected to reach about 50 per cent in 2017, said Guglielmin. That probably won’t help the company turn a profit anytime soon. Ballard has reported losses in 17 of the past 18 years. It’s been a long road for Ballard, which traces its roots back to 1979 when its predecessor Ballard Research Inc. began researching lithium batteries. It started developing fuel cells in 1983. Fuel cells use hydrogen to create electricity through a chemical reaction. Some, like Ballard’s run on pure hydrogen, and other companies’ systems extract it from natural gas. They already help power more than 100,000 homes in Japan and are used in fork lifts, remote telecommunications towers and satellites, and for large, stand-alone power plants. The technology is also winning over prominent backers, including Royal Dutch Shell Plc, Toyota Motor Corp., and Panasonic Corp. which are bringing fuel cells to cars, petrol pumps and homes. Volkswagen AG has an $80 million deal with Ballard aimed at getting Audi hydrogen cars on the road. In September, Ballard began delivering the first of 330 fuel-cell buses to two cities in Guangdong province, Yunfu and Foshan. That order alone will quadruple the global fleet of hydrogen-powered buses. 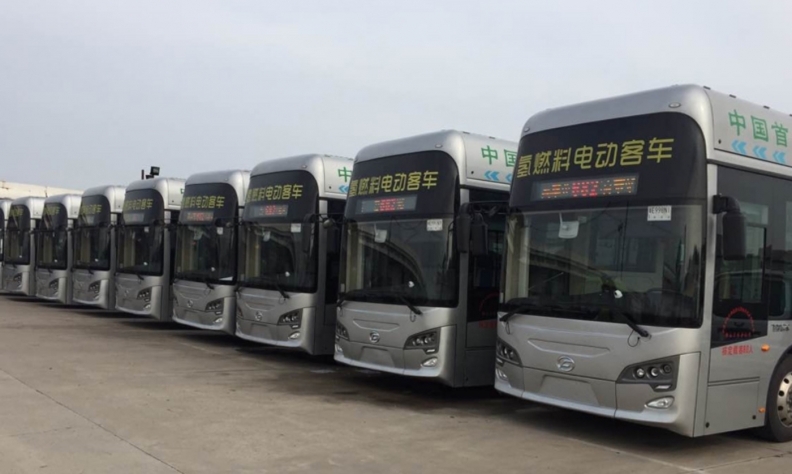 China reported sales of 296,000 electric or hybrid buses in 2015, about 27 times the size of the European market and almost 60 times more than North America, according to Ballard data. Government subsidies there favour fuel-cell vehicles over battery-electric ones -- a hydrogen car gets a 400,000-yuan (CDN $77,000) subsidy, about nine times what’s offered for battery vehicles, and a large fuel-cell bus can get as much as 1 million yuan (CDN $19,000), according to a March 13 investor presentation. Zhongshan Broad-Ocean Motor Co., Ballard’s biggest shareholder, is building three factories in China to make fuel-cell modules for vehicles using Ballard technology. Fuel-cell cars lag behind battery-electric vehicles, even though hydrogen cars offer faster refuelling. They may hold an edge in trucks and buses, because batteries get too heavy when scaled up for larger vehicles, Guglielmin said. Predictable routes also work well with fuel-cell vehicles, said Jeffrey Osborne, an analyst at Cowen & Co.
Guglielmin the key to fuel cells is the ability to drive down costs, and Ballard now sells fuel cells 60 per cent cheaper than five years ago, he said. Joint ventures to produce fuel cells in China will drive down costs ever more. “In China, one could imagine a module at 50 per cent to 70 per cent of the cost today,” said Guglielmin.